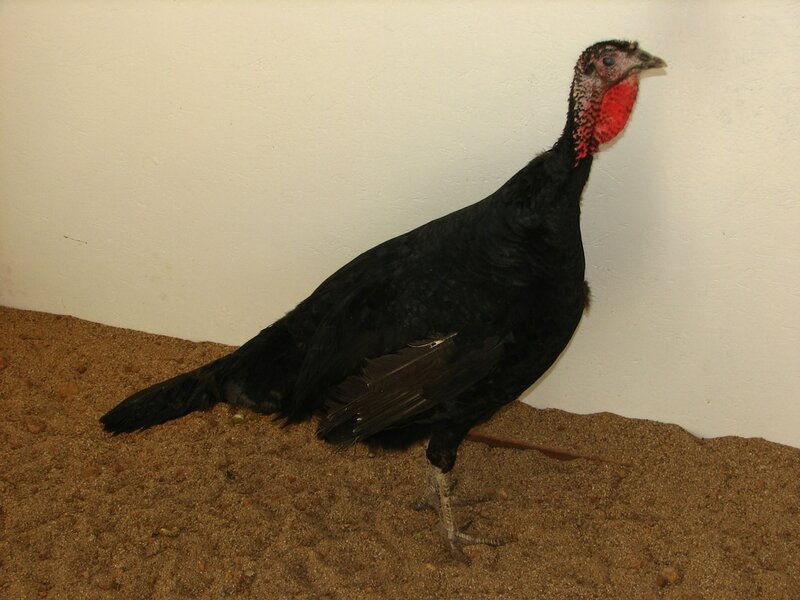 Black turkeys are one of the oldest varieties of turkeys, admitted to the APA Standard in 1874. Genotype is BB. All feathers should be black although a slight tinge of bronze in the back and tail is acceptable. Some people refer to them as "Norfolk Black" or "Spanish Black" but our standard refers to them merely as "Black" with no other distinction. Barring in the wings indicates a bronze gene is present, called Barred Black, genotype Bb. For 2018, I am using a Barred Black tom over my Slate hens. 25% of the offspring will be pure Black and can be differentiated from the Barred Black at hatch. The hen pictured above was crossed with a Standard Bronze to improve the temperament and size of my Blacks. Contact me if you are interested in Barred Black or Black turkeys.